What follows is the experience that originally inspired the creation of the Good, Bad, and Ugly Design forum. The story is absolutely factual. Picture if you will the following homeowner quandary: Lots of old videocassettes and no convenient place to put them. My wife suggests that surely someone has a rack that could hang on a closet door. Quick Google search. Bingo. Yes of course, you can buy them online. So we went shopping, followed by a naïve purchase, based on the assumption that something sold to hold videos while hanging on the back of a closet door would tend to function in such a way. The device is simple enough, as you can imagine. Installation consisted of taking it out of the box and hanging it on the closet door. 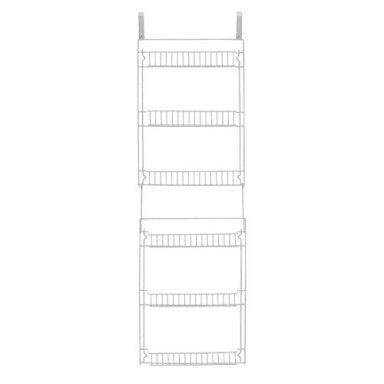 First problematic observation was that the sides of each rack were open so that the video on both ends of each shelf was about half on the shelf and half hanging into space. Each time the door opened and closed, there was a non-zero chance that one or more videos would slip out the side of one shelf or the other and plummet to the carpet. Trouble enough, but amazingly enough, not the big problem. My wife installed the thing on the door (as I said, by hanging it there) and began to put videos onto it. Her bad. The rack had multiple shelves, and probably held maybe 100 videos (approximately the size of our pile). By the time my wife was filling the last shelf row with videocassettes, the most fundamental design flaw was revealed. The brackets holding this thing on the top of the door were made of soft metal, sort of a soft aluminum (harder than a pop can, but weaker than a tin can, albeit thicker). What were the designers thinking? Obviously they weren’t thinking that if someone hangs this thing on a door and puts a video in each spot designed to hold one, that before the entire shelf was full, the weight of the videos would cause the brackets to simply flex and bend, and that the entire contraption, including maybe 30 pounds of video cassettes would come crashing to the floor in a heap. I could understand it if we had taken something entirely out of its designed function (such as our ill-fated adventure at housing a hamster in a bird cage) and tried to put videocassettes into it. But this device was designed to hold precisely as many videos as she placed onto it, but was not simultaneously designed to actually remain on a closet door afterward. Tuition cost: $39.99 for the rack, $7.95 for shipping, $39.99 refunded, another $7.00 to ship it back, lost time to clean up videos, vent our spleens, repackage and ship back. Net loss: $14.95 for a product that was never designed to work in the first place. Epilogue: The company that sold us the “Over-the-Door Rack – Video” apparently no longer sells such a device, functional or not. The device in question can be purchased, but you won’t find it mentioned as a “video rack.” Poor design? Overzealous marketing? We may never know.